Cover Reveal for Forever Fudge out September 25, 2018. Isn't it cute? Hi, Allie McMurphy here. I love this cover, although I think Mal, my puppy, wishes she had a tiara on her head instead of a bow tie. Maybe she'd like some pearls or a pink bow as she is a bit of a girlie girl. It's sad when your dog is more girlie than you are. All teasing aside, she is always happy to be on the cover. Carmella, my kitty, thinks she should have been on all the covers, but I told her she hadn't adopted us in the first couple of books. My pets are sweet, sassy and smart and help me so much when trouble comes to Mackinac Island, Michigan. One of the most famous things about Mackinac Island, besides the fudge and the Victorian cottages and the fact that we don't have cars on the island is they filmed the movie, "Somewhere in Time" here. Recognize the gazebo? It's currently at the Governor's mansion and available for rent. Well, now a couple of Hollywood producers have the great idea to return to the island to shoot a new television series. The whole island is a buzz with gossip about being on TV. There is a silly competition to see which side of Main Street will be chosen as the main backdrop for the outside scenes of the pilot. They even think an auction of the film rights would help stir up the economy. As for me, I'm staying out of it. I'd rather save my money to build a new roof top deck for next season's events. That is until Mal sniffs out a real murder in the alley behind the Historic McMurphy Hotel and Fudge Shop. It's a man shot in the head and holding a note. In the note, the killer is challenging me to catch them before they kill again. To complicate matters, Hollywood heartthrob, Dirk Benjamin, shows up at the crime scene. He's playing the lead role in the pilot-that of the local cop who solves murders. Now he's shadowing Officer Rex Manning to see how cases really get solved. Except that Dirk doesn't have the stomach for a real investigation and things get really sticky from here. Want a chance to win a copy of one of the Candy-coated mystery books currently out? Leave a comment telling me if you've seen the movie and where your favorite gazebo is. I have not seen the movie. My favorite gazebo is Sea Breeze Point at Disney's Boardwalk Inn. A beautiful wedding venue. You are the winner of the free book! Please email me (nancyjparra at yahoo dot com) your address. I haven’t seen the movie. My favorite gazebo is in a local park in the middle of a perennial garden. I have not seen the movie. My favorite gazebo was on private property, it burned down a few years back. I have not seen the movie, "Somewhere in Time", yet but I would love too. My favorite gazebo is at the gorgeous Missouri Botanical Gardens in St. Louis, MO. The gazebo there is very popular as a wedding spot. I love everything about this garden and go to it any time we are in the area. The special events there are amazing. Highly recommend it as a place to go. 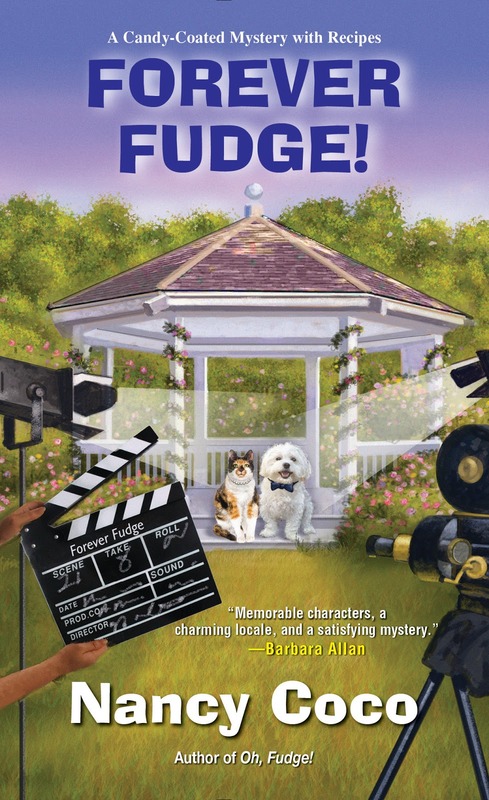 Can't wait to read "Forever Fudge" and absolutely love everything about the cover! Purple is my favorite color and what adorable fur-babies in the gazebo. The storyline is one that has me hooked. I'm sure it's going to be a great read. Thanks for chance to win one of your awesome books. I love Somewhere in Time. My favorite gazebo is of course the one on Mackinac Island. That’s because Mackinac Island is my favorite place to visit and I go there every chance I get. Thankfully I live not far from the island. I also love reading books where the setting takes place on Mackinac Island. I’m anxiously waiting for this book to be released. Love the gazebo (well, the whole setting) in Bar Harbor, Maine. Great. I can't wait for it to be released. One of my favorite series. I have seen the movie Somewhere In Time several times. I've also been to Mackinac Island quite a few times and visited the beautiful Grand Hotel. One of the suburbs in Chicago has a really nice gazebo in one of their parks. Love this series, I can picture Mackinac Island when I'm reading this series. I've not seen the movie and the most memorable gazebo for me was the beautiful white one in the field at my preschool when I was little. I've not seen the movie. My favorite gazebo is on the grounds of Belmont Mansion in Nashville. As a kid, I spent a number of summer days on Belmont's campus. I've not seen the movie. My favorite gazebo is of course on Mackinac Island..which is my favorite place to visit. Yes, I have seen the movie. My favorite gazebo is on a friend's property. I've never seen the movie. When my son was younger, we used to take early morning bike rides. There was a gazebo along the bike path where we would sometimes stop to eat the breakfast we had packed. I have seen the movie. Long ago. There is a lovely gazebo in the nearby park. Haven't seen the movie. It's in a park near my mother-in-laws. I have not seen the movie. I love gazebos but there are only privately owned ones near me! I’d love to win this book! Thanks for the opportunity! Somewhere in Time is one of my favorite movies! I love the setting, costumes, and scenery. I've read the book the movie is based on and have the soundtrack CD because the music is so beautiful. Of course I've been to Mackinac Island and loved it! I like Victorian homes and there are some beauties on the island, as well as the wonderful Grand Hotel. My favorite gazebo is in Medina, Ohio. The gazebo is in the park in the center of the old fashioned town square. It is quaint and a lovely place to visit. This is one of my favorite movies. It's so sad but I loved it. My favorite gazebo is actually in my parents yard and my mom and dad built it themselves! Thanks for the chance to win, I love this series so much!